This year we are discussing the Book of Martial Power (BOMP). The Primary Gate - control the position and motion of the center of the opponent's chest (the triangle between shoulders and solar plexus) and you more easily control the entire opponent. If you leave your primary gate unguarded, you are more easily struck or controlled through it. Pearlman's examples are mostly about striking through or into the Primary Gate of the opponent, but the concept comes into play in grappling arts, like aikido and judo, too. 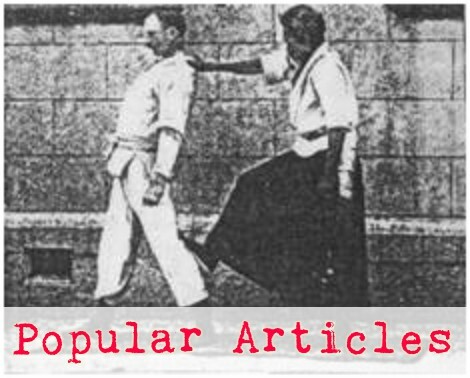 In judo, it is generally advantageous to have the inside grip, meaning you have you hands on his body with your arms occupying the primary gate. This allows you to deliver power directly to him, while forcing him to take an outside grip, and deliver power to you in a roundabout way. In aikido, I tend to think about this Primary Gate as a sort of Cone of Power, or funnel, with its apex at the opponent's chest and sides mostly congruent with their arms. Inside this cone is most of the opponent's power and potential. 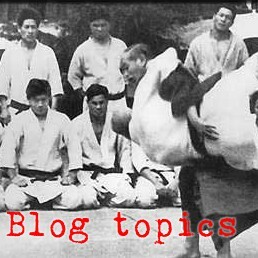 Aikido's two primary tactics involve either spearing through this funnel into uke's Primary Gate (irimi) or else turning out of the way of uke's force and potential - mostly outside uke's cone of power (tenkan). A good randori game is to do some light randori, looking for times when your hands (holding him) are inside your cone of power and his hands (holding you) are outside his cone of power. At this point, you are relatively stronger and he is relatively weaker. You can execute a technique at this point, but I usually like to just hold him in this potition long enough to mark it in my mind, then return to randori.